Prepare jaggery syrup by dissolving jaggery in boiling water and strain to remove all the dirt particles. To check if the syrup is ready, put a drop of the syrup in a saucer of cold water. The drop should remain hard and not dissolve in the water. Soak rice in water for one day. The following day drain the water out and keep it under a weight. Once all the water is drained from the rice, pound it to a fine powder. Sieve it. Boil the granules of powdered rice that do not go through the sieve with ½ seer (about 2 cups) of water, cardamom and jaggery syrup. To prevent it from getting stuck to the bottom of the vessel and to prevent lumps, pour a teaspoon of ghee and keep on stirring. Remove the vessel from fire. Add the rice powder a little at a time and keep on stirring. Then add Maida. Once again keep it on the fire. As soon as it is cooked a little (i.e., just becomes hot) remove it from the fire. Stir well and cool. Then put the dough in a jar and press it firmly. Pour 2 teaspoons of vegetable oil on top to preserve it. When required take out the dough and knead well. Make lime size balls. Dip in poppy seeds or gingelly. 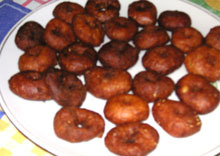 Flatten, make a hole (kanna) in the center of each ball and deep fry in hot oil until dark brown in colour.